BioWare Co-Founder: RPGs Are Becoming "Less Relevant"
BioWare co-founder Greg Zeschuk says RPGs are becoming "less relevant" as a genre to the current state of videogaming. When you think about RPG studios, one of the first and foremost to spring to mind is very likely BioWare. This is the company that made its bones by bringing back the moribund RPG genre with the 1998 classic Baldur's Gate, after all, and then blew things wide open with follow-ups like Baldur's Gate 2, Neverwinter Nights and, more recently, Mass Effect and Dragon Age. But the times, they are a-changin', and according to Dr. Zeschuk, the nature of the RPG and its relevance to gamers is changing too. "RPGs are and always have been our bread and butter, our heart is there, but at the same time I think - well, we had the RPG panel breakfast at GDC yesterday - and what was interesting about that was that we had the conversation about 'what is an RPG,' and it's a blend," he told VG247. "The genres are blending right now, you're getting lots and lots of progression and RPG elements in shooters - online persistence and so on." "It's funny because the RPG in the context of the current world is - well, it's not specifically irrelevant, but it's becoming less relevant in and of itself," he continued. "It's more a function of, 'Hey, this game has a great story.' For us, [it's] having that emotion but also having other great features like combat and persistence of character progression and stuff." It's not hard to see BioWare's changing attitude reflected in its more recent games, particularly Mass Effect, which is not so much an RPG as it is a conversational shooter. "We're just about great games," Zeschuk added, and RPG or not, the Mass Effect series has most definitely been hot stuff. 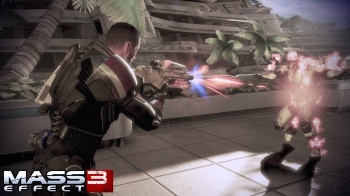 Mass Effect 3 is currently scheduled for release on March 6 for the PC, PlayStation 3 and Xbox 360.